The V3 T6 kits will ship out to you in the order in which final payments are received, due to the magnitude of kits sold in this sale we expect the first half of these to ship in 2-3 weeks and the remaining in roughly 6-8 weeks. Turbos: This new V3 T6 kit is based on fitting T6 S400 turbochargers. Units with a V2 race cover will require removal of your Power Steering and ABS for clearance of the larger housing. -Standard for this new V3 T6 kit is our standard 4″ Thick FMIC. A brand new High efficient option is our HSP Black Series. We offer this in both 4″ and 6″ thick with air guides built into the end tanks to promote better, more efficient use of the entire core! We also still have the BELL 4.5″ and 6″ Core options as well! These above are all excellent options for those looking to make over 900hp where the base intercooler becomes inefficient. New as of now are the Platinum Series Air 2 Water units from Bell. These coolers bolt on to the brackets supplied in the kit, however will require you to set up your water/ice tank with pump and run your lines. -Standard 5″ to 4″ 2-piece downpipe with Wideband bung. Optional full 5″ 2-piece downpipe with a wideband O2 bung/plug available as well. These downpipes will be flanged for S400 turbos. 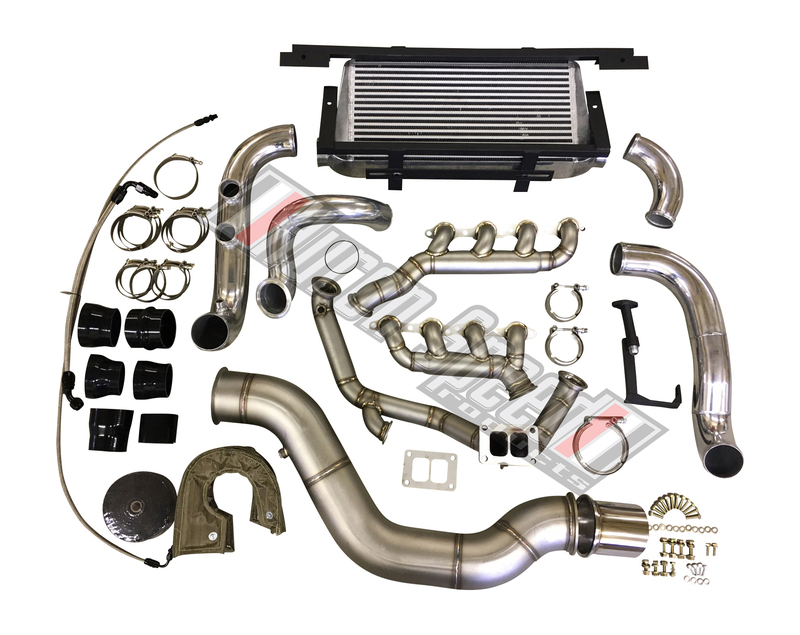 -New V3 T6 Cold-Side piping is all ALUMINUM and 3″ – 3.5″ from the turbo’s outlet, through the standard, HSP Black Series or Bell Intercooler, and into the TB. 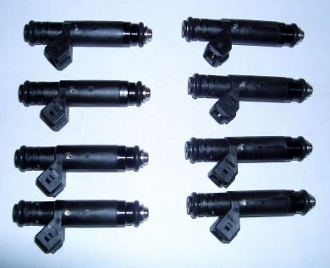 It is a 4-piece design for easy install and using only STRAIGHT Couplers to connect. Diffferent intake set-ups such as hi-rams, etc will require some minor tweaks on your end to mate to. The V3 T6 cold side piping now comes standard with (2) 50mm BOV flanges and a THREADED IAT sensor bung welded in, All standard features! -Please allow 1-2 weeks to your order if having any coating done. * 2.25” extra thick .120 wall Stainless Crossover with divided T6 flange, True divided crossover set-up with twin 44mm WG flanges (one per bank) and bungs for primary O2 sensors. * 5″ to 4″ 2-piece downpipe with a wideband O2 bung/plug included. S400 Flanged. 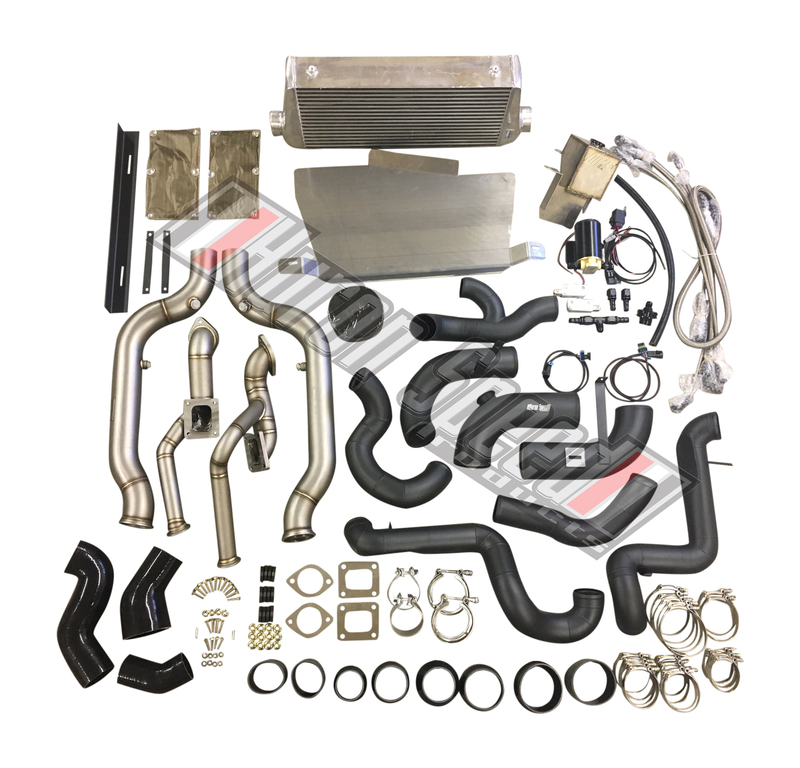 Optional full 5″ Downpipe available. *Turbo Support bracket that also doubles as the turbo oil drain for easy hook up. *Standard Base 4″ Thick Intercooler included. 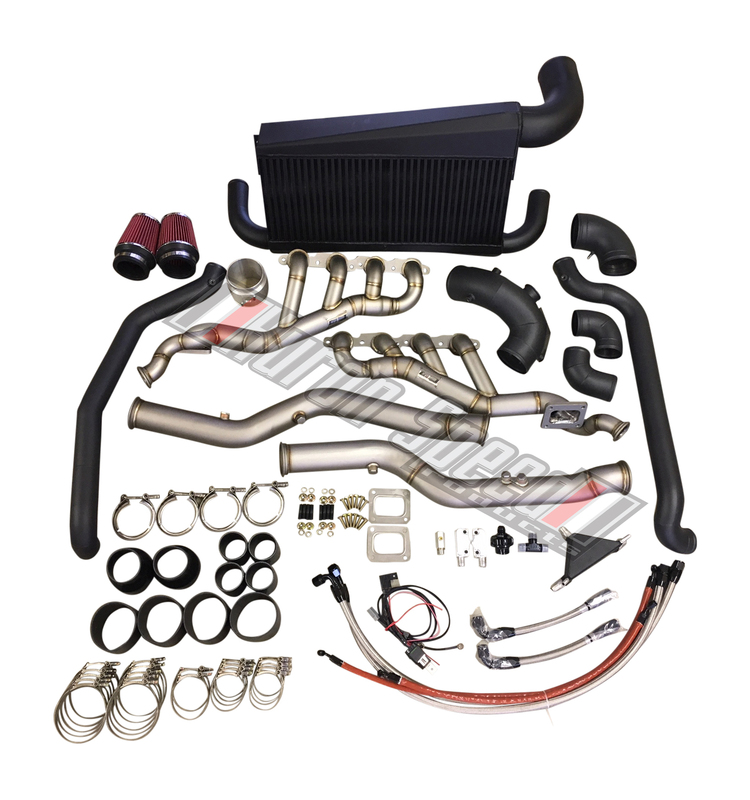 HSP Black Series 4″ or 6″ Thick w/ Airguides Optional as well as the 4.5″ or 6″ Thick Core BELL intercooler with direct bolt on brackets with 3.5″ Inlet and Outlet. *Grade 8 Bolt/Hardware Kit included! *Kit requires: Stood up radiator (dual pass recommended) with coolant hoses and fans to clear piping/turbo. A/C removal. Relocation of battery and coolant overflow tank to fit the charge pipe to throttle body. 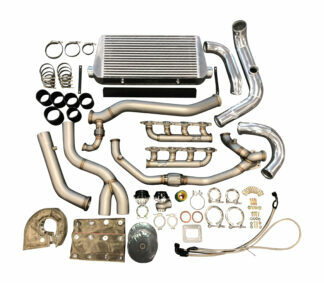 Requires turbo, wastegates, BOV, and Oil lines as well to complete (all of which we can supply at final checkout!) 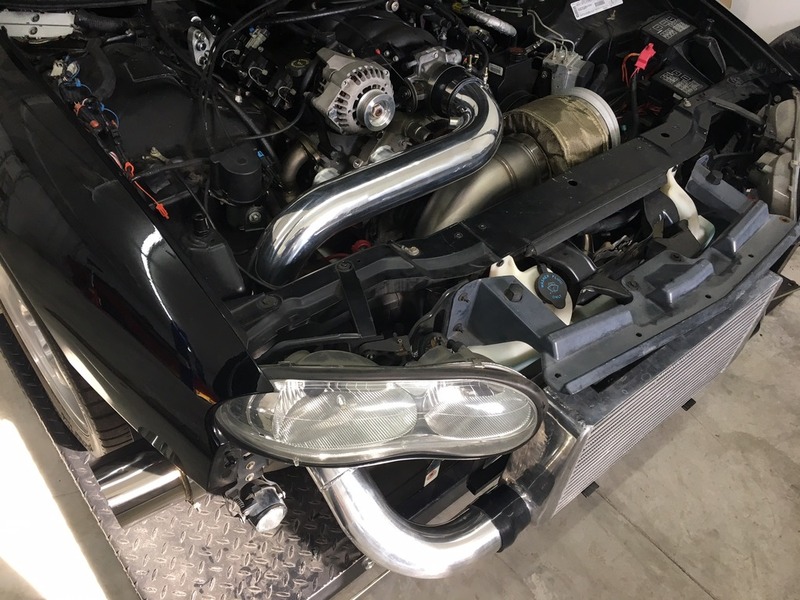 Lower Radiator Hose outlet may require modification depending on your specific placement of the radiatior. *Kit RETAINS: OEM Alternator location, OEM Front Sway bar, *OEM Power steering, *ABS, and OEM or any aftermarket K-member! 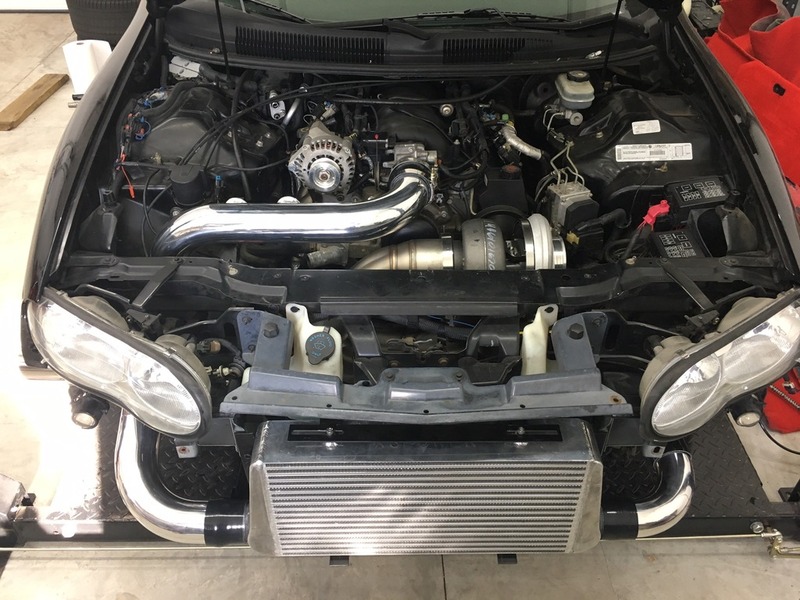 *Retaining ABS and Power steering is no problem with a standard S400 turbo, or any HSP/Comp S400’s. If using a V2 Race Cover unit from Forced Inductions, we recommend removing ABS and Power Steering.